Whale Waste at the Bottom of the Ocean? July 6, 1976. U.S. Naval Academy, Annapolis, Maryland. Induction Day for the Class of 1980. I'm on the right. 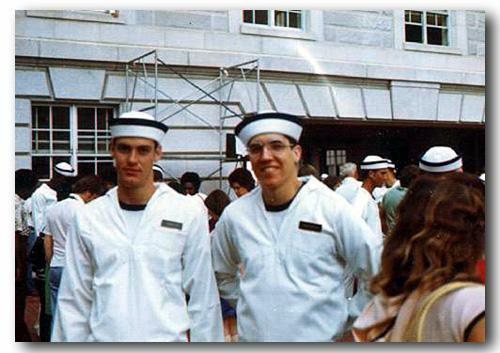 Roommate Brad Gehrke is on the left (Brad went on to command a Trident submarine). This photo was taken a few hours after I became targeted for "early retirement" when the Class of '77 firsties (first class midshipmen, the drill instructors of Annapolis' plebe summer, analogous to basic training or boot camp) lined up the new recruits, the plebes, and walked down the ranks screaming, "What's lower than whaleshit at the bottom of the ocean?" A lone sarcastic voice had replied, "Class of '77, sir!" A few suppressed snickers punctuated the rapid footsteps of the firsties as they arrived at the face of the plebe who'd made the impudent remark - me. I could barely believe I'd done something so stupid. Over the course of plebe summer I would lose twenty pounds I couldn't afford to lose and obsess over being kicked out. It was close, but letters from my parents helped. What we didn't know when this shot was taken was that within hours we'd literally be using the sinks in our rooms for urinals so we didn't have to encounter firsties in the passageways - we were that petrified. We lost about 20% of the class that wonderful summer as the pressure got to the plebes.